The independent watch manufacturer from Biel, Armin Strom, is the official time keeping partner of the Marussia F1 Team. The bridges of the movement are crafted out of components from an original Marussia F1 car. As always, the Armin Strom watch has been skeletonised and hand engraved. This exclusive two-piece only Armin Strom Racing Tourbillon watch is the 6th model in their Racing Collection. As you can read and see before (in this article), the Armin Strom brand has a long history in wonderful skeletonised and engraved timepieces. Founder Armin Strom was already contracted by some famous brands before starting his own watch collection. The Armin Strom collection is a successful range of hand-engraved and skeletonised watches. Watches with a great design without become a watch that is classic of to formal due to the skeleton work. The Racing Tourbillon has an in-house developed and manufactured tourbillon movement which Armin Strom refers to as caliber ATC11-MR. The alloy parts from one of the official Marussia F1 cars have been used for the bridges in this movemement and are fully skeletonised. To commemorate the fact that Armin Strom is the official timing partner of the Marussia F1 Team for the 3rd season in a row, they introduce this Racing Tourbillon reference TI13-TR.90 timepiece. The titanium case has received a black PVD treatment for a sporty appearance and the Marussia F1 Team colors have been applied to the aluminium allow bridges made from original F1 car parts and to the beautiful and comfortable leather strap. Limited to 2 pieces only. 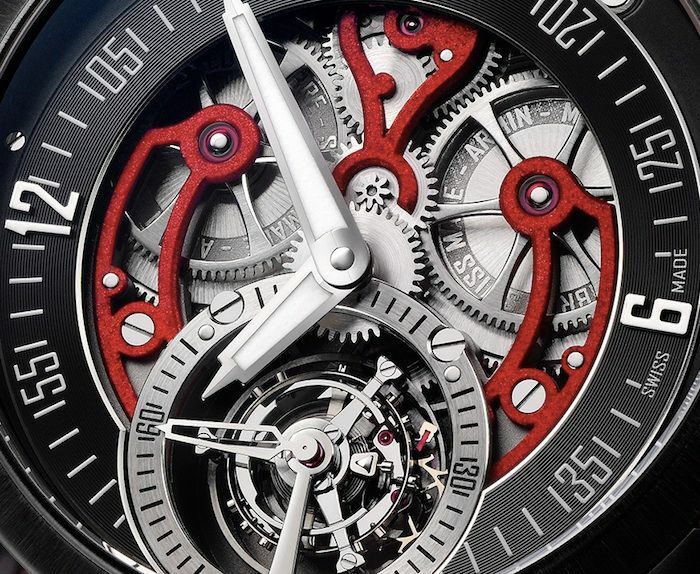 Armin Strom’s Racing Tourbillon watch has a 43.4mm diameter and a 13.3mm height. Besides the alligator strap with double folding clasp, you will also get a rubber strap for this watch. 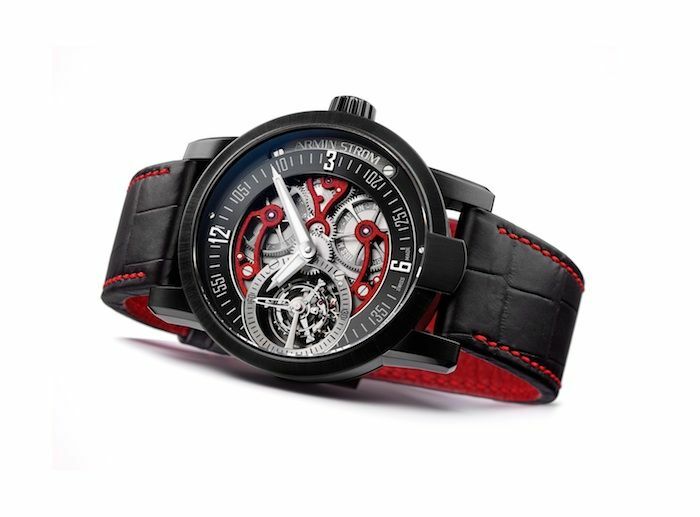 Make sure to visit the official Armin Strom website to see more of their impressive collection.